Problems With the Number Needed to Treat | Less Likely Problems with the Number Needed to Treat The number needed to treat is a popular statistic used in medicine, but it has several problems associated with the way it is used and in this blog post, I discuss some of those problems and possible solutions. The number needed to treat (NNT) is a popular statistic used in medicine and its use is even encouraged by groups like Cochrane and CONSORT. Why is it so popular? Most believe that the NNT is more understandable than effect sizes like odds ratios or risk ratios or statistics like the absolute risk reduction. The NNT is also believed to convey more meaningful information. The NNT is defined as the number of patients that need to be treated for one patient to experience a positive outcome or for one patient not to experience an adverse outcome. So, an NNT of 100 means that 100 patients need to be treated for one patient actually to benefit. 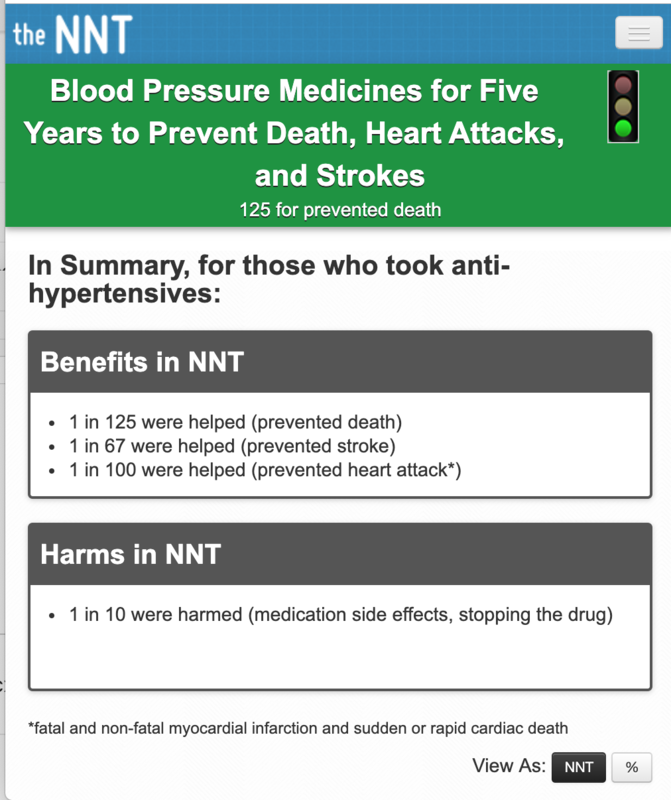 The NNT is the inverse of the absolute risk reduction (ARR) (1/ARR). I will show how they are calculated with a sample contingency table from a controlled study comparing the drug Apixaban to placebo for recurrent thromboembolism (RT), which I took from (Motulsky, 2014). Apixaban is the treatment for the first row and placebo is the treatment for the second row. Bolded numbers are the totals. We will calculate four different measures: incidence proportions, absolute risk reduction, relative risk, and then the NNT. In the group that received the drug, 14 people experienced RT out of 840 people (14/840). So, about 1.7%. In the control group, 73 people experienced disease progression out of 829 people (73/829), which is 8.8%. These are incidence proportions. We calculate the absolute risk reduction by finding the difference between the incidence proportions: 8.8% (control group) - 1.7% (treatment group) = 7.1% So, the use of the drug Apixaban lowered the absolute risk of RT by 7.1%. In words, patients who took placebo were 5.2 times more likely to develop RT than patients who took Apixaban. We can also do 1.7% / 8.8% = 0.19, which means that people who were treated with Apixaban had 19% of the risk that the control group had in developing RT. Relative risk is more easily understood than absolute risk reduction, but relative risk can also be deceiving, and most in medicine prefer to work with absolute risk reduction, so they prefer to use the numbers needed to treat which can be calculated by taking the inverse of the absolute risk reduction which is 1 / 7.1 = 14. This means that 14 people need to be treated with Apixaban to prevent one case of recurrent thromboembolism. Now that we know how to calculate the NNT, we can discuss the problems with it. A minor note before I get into this, some statisticians are entirely against the use of the NNT because they believe that it has poor statistical properties mainly due to its non-monotonicity and fusion with infinity as a possible value (Duncan & Olkin, 2005; Hutton, 2000; Kristiansen, Gyrd-Hansen, Nexøe, & Nielsen, 2004; Stang, Poole, & Bender, 2010; Wu & Kottke, 2001). There are also several other problems such as bias that cannot be corrected for and difficulty calculating confidence intervals with standard errors. Most of these statisticians recommend using the absolute risk reduction instead because it has good statistical properties. I have listed the papers in the reference section of this article. And another page about hypertension but mainly focused on primary prevention. Now, most people might take these NNTs and compare them across the board, but unfortunately, you cannot do this if you do not know what the comparators being used here are. The NNT group does have the comparators listed in the middle of the page, but they should be at the top right next to the NNT. 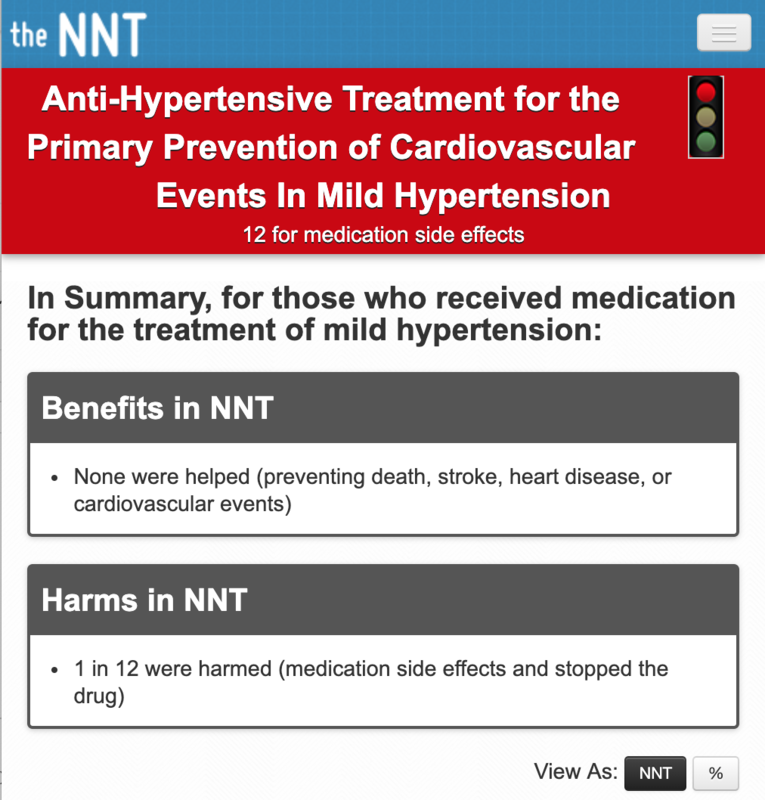 Is it likely that statins are superior to antihypertension medication for primary prevention of CVD events? Probably, I’m not entirely sure. Can we compare them this easily by using only NNTs? No. The NNT seem very easy to understand but are not interpretable without explicit mention of their comparator. Solution: Explicitly state the comparator next to each NNT. Another problem is the lack of confidence intervals for the NNTs. Again, NNTs are point estimates, and the uncertainty of the estimate should be displayed right next to the estimate; otherwise, readers will be fooled into thinking that the number is a definitive estimate. Solution: Calculate and display the confidence intervals of the NNT right next to it. An NNT without the accompanying time period of the trial or cohort is genuinely meaningless and deceptive when compared across the board. 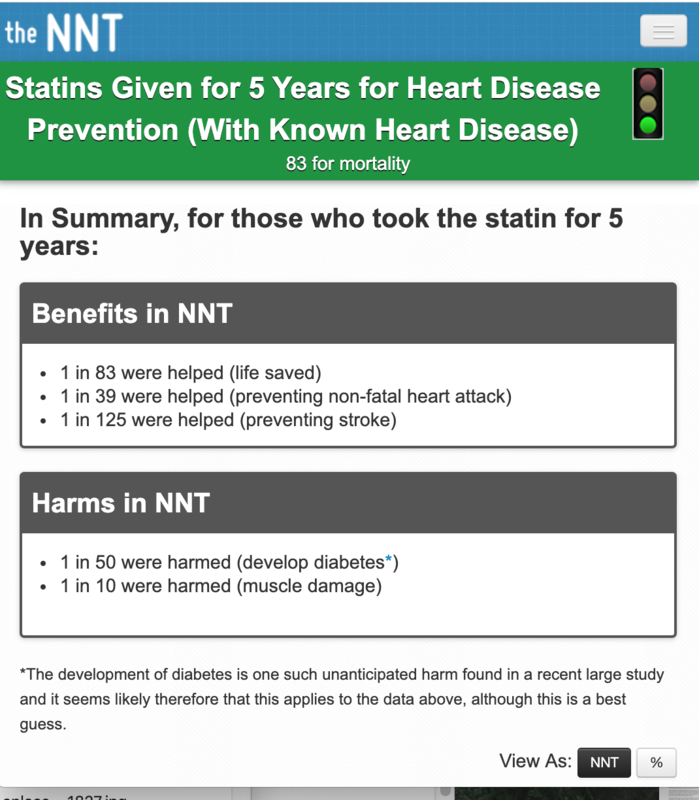 For example, if fish oil for preventing heart attacks had a hypothetical NNT of 10,000 in an RCT that was one year long, and another NNT that was 500 in an RCT that was ten years long, you cannot just blindly compare an NNT of 10,000 to an NNT of 500. Perhaps the intervention takes a long time to work. You are, again, missing vital information if you state the NNT without any accompanying information. Solution: State the time period of the study that the NNT is calculated from. Another typical behavior is to round NNTs up because most people do not think it makes much sense to think of part of a patient. For example, people would rather not think that it takes 14.3 patients for one patient to benefit, so they round up. This is a mistake because numbers needed to treat were never meant to be discrete integers, they are estimates and the inverse of risk reductions. If we had an absolute risk reduction that could be between 0.349 and 0.49 and we took the numbers needed to treat from the absolute risk reduction in this interval, they would all round up to 3! In practice, all of these NNTs would be rounded up to 3, when there are apparent differences between the absolute risk reduction. NNTs should not be rounded up to the nearest whole integer out of a fear of working with decimals because this will lead to omission of valuable information. Solution: Don’t round the NNT to the nearest whole integer. As we can see, numbers needed to treat are not free of problems. While they may convey information that is a lot more intuitive, the statistic itself does not seem to be without issues, and the way they are used in medicine is also a problem. However, a lot of these issues can easily be circumvented with proper reporting. Motulsky, H. (2014). Intuitive Biostatistics: A Nonmathematical Guide to Statistical Thinking. Oxford University Press. How Did We Figure Out Smoking Causes Lung Cancer?